The National Geographic Magazine, later shortened to National Geographic, is the official journal of the National Geographic Society. It has become one of the world's best-known magazines and is immediately identifiable by the characteristic yellow border running around the edge of its cover. There are 12 monthly issues of National Geographic per year, plus additional map supplements. On rare occasions, special editions are also issued. It contains articles about geography, popular science, world history, culture, current events, and photography. 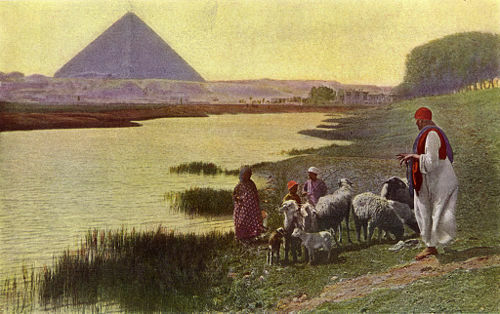 The fame of the magazine worldwide resulted from its pioneering use of photojournalism, providing spectacular color images of nature from locations around the world. Beyond introducing the public to the beauties of nature, the magazine has more recently taken on a number of issues related to preservation and stewardship of the environment, thus contributing to human responsibility for the beauties of creation. 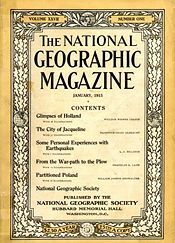 The "National Geographic Society" has been organized "to increase and diffuse geographic knowledge," and the publication of a Magazine has been determined upon as one means of accomplishing these purposes. As it is not intended to be simply the organ of the Society, its pages will be open to all persons interested in geography, in the hope that it may become a channel of intercommunication, stimulate geographic investigation and prove an acceptable medium for the publication of results. Initially a rather scholarly journal with an appropriately formal and dull appearance, it became a monthly magazine in 1896. Under the leadership of Gilbert Grosvenor, the magazine began to focus less on technical articles and more on general interest subjects. Grosvenor also pushed the magazine to its current format of featuring large, high-quality photographs. By 1908, 50 percent of the magazine was composed of photographs. During the Cold War, the magazine committed itself to presenting a balanced view of the physical and human geography of nations beyond the Iron Curtain. The magazine printed articles on Berlin, de-occupied Austria, the Soviet Union, and Communist China that deliberately downplayed politics to focus on culture. In its coverage of the Space Race, National Geographic focused on the scientific achievement while largely avoiding reference to the race's connection to nuclear arms buildup. In later years the once-benign articles became outspoken on issues such as environment, deforestation, global warming, and endangered species—a scope expanded to topics well beyond exploration curiosities. Series of articles were included focusing on the history of specific products such as a single metal, gem, food crop, or agricultural product, or an archaeological discovery. Occasionally an entire month's issue would be devoted to a single country, past civilization, natural resource, or other theme. In addition to being well-known for articles about nature, history, and the most distant corners of the world, the magazine has also long been recognized for its book-like quality and its standard of photography. This standard makes it the home to some of the highest-quality photojournalism in the world. The magazine began to feature color photography in the early twentieth century, when this technology was still rare. During the 1930s, Luis Marden (1913 - 2003), a writer and photographer for National Geographic, convinced the magazine to allow its photographers to use small 35 mm cameras over bulkier cameras with tripods and glass plates, allowing greater flexibility and mobility in filming. Supplementing the articles, the magazine sometimes provides maps of the regions visited. The Society's map archives have been used by the United States government in instances where its own cartographic resources were limited. President Franklin Roosevelt's White House map room was filled with National Geographic maps. A National Geographic map of Europe is featured in the displays of the Winston Churchill museum in London showing Churchill’s markings at the Yalta Conference where the Allied and Russian leaders divided post-war Europe. In 2001, National Geographic released an eight CD-ROM set containing all its maps from 1888 to December 2000. In 1959, the magazine started publishing photographs on its covers. The magazine cover, while keeping its yellow border, shed its oak leaf trim and bare table of contents, for a large photograph taken from one of the month's articles. By the end of the twentieth century, National Geographic magazine was published in thirty-two different language editions around the world. In April 2005, an Indonesian edition was launched, published by Gramedia Majalah - Jakarta. A Bulgarian edition of the magazine was launched in November 2005 and a Slovenian edition was launched in May 2006. A Serbian edition of National Geographic was launched with the November 2006 issue. In contrast to the United States, where membership in the National Geographic Society was formerly the only way to receive the magazine, the worldwide editions are sold on newsstands in addition to regular subscriptions. In several countries, such as Hungary, Slovenia, Croatia, and Turkey, National Geographic paved the way for a subscription model for magazines in addition to traditional newsstand sales. 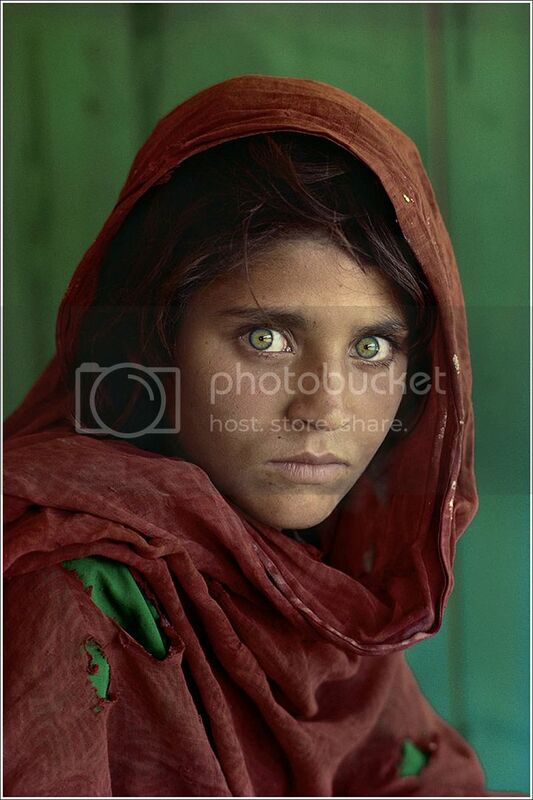 The famous cover photograph of the June 1985 issue of National Geographic was of an Afghan refugee, a beautiful young girl with hauntingly green eyes. The photograph was taken at the Nasir Bagh refugee camp in 1984 by photographer Steve McCurry. The girl was one of the students in an informal school within the refugee camp; McCurry, rarely given the opportunity to photograph Afghan women, seized the opportunity and captured her image. She was approximately 12 years old at the time. Although her name was not known, her picture, titled "Afghan Girl," appeared on the June 1985 cover of National Geographic. The image of her face, with a red scarf draped loosely over her head and with her piercing sea-green eyes staring directly into the camera, became a symbol both of the 1980s Afghan conflict and of the refugee situation worldwide. The image itself was named as "the most recognized photograph" in the history of the magazine. After the U.S.-led invasion of Afghanistan, a search was conducted for the (presumably grown) girl. Remarkably, the photographer found her, and she was identified in 2002 as Sharbat Gula, a Pashtun woman married and living with her family, and quite unaware of her fame as a photographic subject. Her story was told in the April 2002 issue of National Geographic and in a National Geographic television documentary. She claimed that the two famous photos of her, the one from 1985 and the follow-up in 2002, were virtually the only times she had ever been photographed. A fund named after Gula was created and originally funded by the Society; it was further supplemented by contributions from thousands of readers. This resulted in a partnership between National Geographic and the Asia Foundation in the creation of a girls' school in Afghanistan that taught hundreds of teenage girls both a vocational and a basic education, in addition to providing a hot meal and health care. The funds also contributed to the construction of a public school for girls in Kabul. Paul Salopek, two-time Pulitzer prize winning writer on assignment for National Geographic to write a feature article on the Sahel region, and two Chadian assistants were arrested and charged in August 2006 with espionage, entering Sudan without a visa, and other crimes by the government of Sudan. After National Geographic and the Chicago Tribune, for whom Salopek also wrote, mounted a legal defense and led an international appeal to Sudan from such world figures as Jimmy Carter, Reverend Jesse Jackson, Bono (Paul David Hewson), and many prominent journalists and press organizations, New Mexico Governor Bill Richardson was invited to Sudan by President Omar al-Bashir. In a meeting the night of Richardson's arrival, al-Bashir said he would release Salopek on humanitarian grounds. National Geographic Editor-in-Chief Chris Johns flew with Richardson and others to El Fashir in Northern Darfur where Salopek was jailed. Salopek was released and flew back home with his wife to New Mexico. His two assistants from Chad were also released and returned to their country. In 2000 National Geographic won a National Magazine Award for General Excellence, the most prestigious award in the magazine industry. In 2005 it won a National Magazine Award in the essays category, honoring excellence in essay writing. The magazine's website won a National Magazine Award for General Excellence Online in 2002, followed in 2003 by the International Web Pages Best of Festival and the Webby's 2004 People's Voice Award for Best Print and Zines. ↑ Birth of the Society Retrieved January 23, 2007. ↑ History of National Geographic Magazine TriviaLibrary.com. Retrieved December 15, 2006. ↑ A Presence at Yalta (National Geographic, 2000). Retrieved December 15, 2006. ↑ Partnerships National Geographic Foundation. Retrieved December 15, 2006. ↑ George Stuteville, Afghan Girls to Benefit From NG-Sponsored Education Fund (National Geographic News, 2002). Retrieved December 15, 2006. ↑ Sudan charges Paul Salopek with espionage (Arabist.net, 2006). Retrieved December 15, 2006. ↑ The `passionate witness' (The Chicago Tribune, 2006). Retrieved December 15, 2006. ↑ Sudan reportedly will free Tribune reporter (CNN, 2006). Retrieved December 15, 2006. ↑ National Geographic Press Room Retrieved January 23, 2007. History of "National Geographic Magazine"
This page was last modified on 9 November 2018, at 18:02.